Auctions are a great tool for property owners who are looking to speed up their sale and maximise the price. We utilise an innovative method of selling real estate through comprehensive advertising backed up by 7 days service and an effective 24 hour on-line bidding facility. We offer this intense, accelerated marketing process for all types of property including flats, houses, land and commercial. 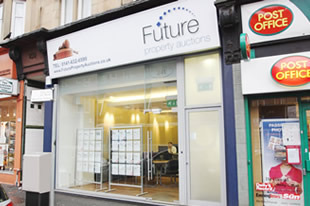 Auctions cover the whole of Scotland with prime sales offices in Glasgow, Edinburgh and Aberdeen. Entries include both vacant and ready let investments. We are Scotland's LARGEST dedicated residential and commercial Property Auctioneer. Our regular programme of large scale property auctions feature lots from throughout Scotland as well as regular properties available for purchase by Private Treaty and Tender. 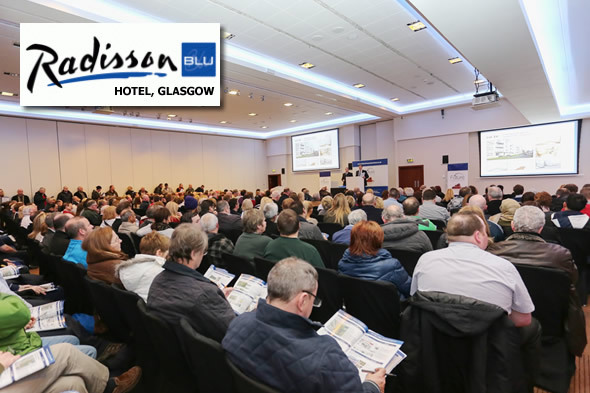 Our Scotland Auction calendar includes 16 Live Auction Events per year with events split between the two largest centres, Glasgow and Edinburgh. One of our experienced valuers will provide you with an auction specific no-obligation free valuation of your property and tailored quote for sales fees. They will also supply you with expert advice regarding market conditions surrounding your particular property and likely buyer demand. All sales are accepted on a no sale = no fee basis so you only have a one off commission to pay when the property sells. Additionally you are able to set a reserve price at the auction which is the minimum price your property can sell for. This will all be agreed and detailed within a sales agreement if you are happy to proceed. You can request your free auction valuation and fee quote online now by completing a quick form. Once you have formally instructed us to proceed one of our professional photographers will next visit your property and produce your high quality auction schedule. The property will then be listed in our colour printed auction catalogue produced every 6 weeks and marketed via our wide range of online portals including Rightmove, Zoopla, S1 Homes, Primelocation and many more. The intense pre-auction marketing campaign lasts for 3 weeks and includes direct marketing to our buyer database of over 100,000 auction buyers. 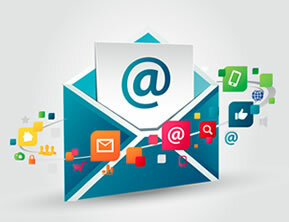 We push your property hard via all modern medias including email, text, twitter and facebook. We will erect a high impact 'For Sale by Auction' sign at your property also for maximum local exposure. All vendors are invited to attend the auction event however it is not mandatory if you are unable to attend for any reason. If the bidding reaches or exceeds your reserve price then the auctioneer will sign the auction agreement by hitting the Gavel (hammer). If the bidding does not reach your reserve price then the auctioneer may hold the highest bid for you and declare a provisional bid. You can then decide whether you wish to accept this offer to which the buyer is bound. If an auction sale is agreed we will secure a 10% deposit from the buyer which is forwarded onto your solicitor less our agreed sales commission prior to the completion date. The buyer will pay the 90% balance through their solicitor on or prior to 28 days (4 weeks) from the auction date. We ensure all contracts are completed and passed swiftly to your solicitor who handles the completion of the sale. Future Property Auctions constantly updates and maintains an extensive buyer database in excess of 100,000 investors. Our buyers are based both within Scotland, the wider United Kingdom and Across the World. Your property is DIRECTLY marketed to our buyer network giving you maximum exposure instantly. Regular updates include new listings, price changes and featured property alerts. Additionally our auctions are marketed via all modern and traditional media including by Email, Phone, Text, Post & Social Media sites. Future Property Auctions supply high quality professional For Sale Signage for your property. Signs are quickly installed and updated at your property by our national contractors. 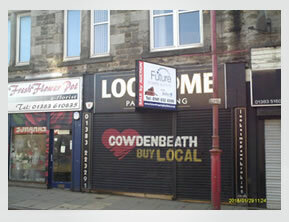 We can supply TBoards, Flag Boards, Commercial VBoards and posters. All high impact professionally designed utilising quality dressed timber. This superb modern city centre venue holds in excess of three hundred of buyers at any one time. This is our largest and flagship auction venue exclusively reserved for Future Property Auction events. 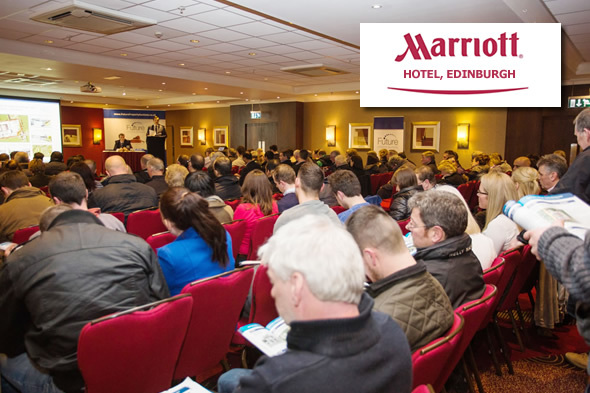 Our luxury east coast auction venue is situated in a conveniently accessible position near the Edinburgh airport and all major transport networks. Facilities are top class and catering at the event is of the highest calibre. Our day to day activites are run from prime sales offices in Glasgow, Edinburgh and Aberdeen, Scotland's three largest and most important commercial centres. Customers are welcome to visit our offices to discuss their requirements at any time.